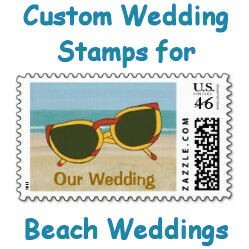 You have found custom postage stamps for beach weddings, that are legal to use in the United States. They can also be used for bridal showers. The designs are created by individual artists that have stores on Zazzle.com. 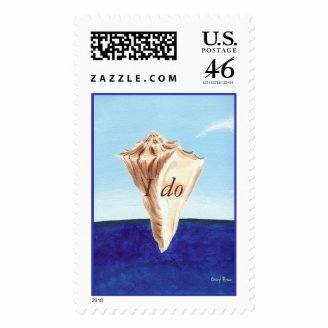 Zazzle is a print on demand company with a wide variety of designs to choose from. Most designs can also be personalized with your special message, wedding date, bride's and groom's names, etc. 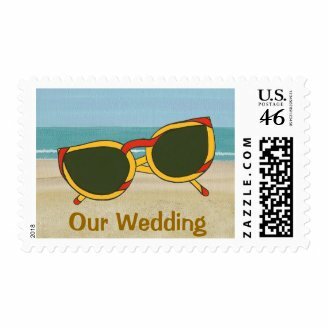 The postage stamps are peel and stick, making them easy to apply to your invitations. You can choose from mostly ocean, mostly sand, and some with hints of other beachy things. The beach can be a great place for a wedding. The rhythm of the waves lapping at the shore, balmy breezes caressing the skin, bare toes wiggling in the sand. Seashells become keepsakes. Sunglasses are plentiful. 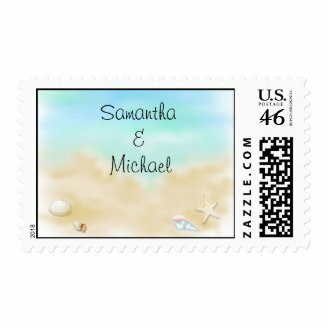 There are plenty of ideas to personalize the theme for your beach wedding, making it uniquely your own. I've done some of the researching for you, hopefully making your search for the perfect design, easier for you. The text on the stamps below can easily be changed on the template forms. Just click on the design of your choice, type in your text in the template box (You'll find it to the right once you're on the product page. ), and then hit the Enter key on your keyboard. Let's start with the beach and mostly sand. Do you want a subtle reminder for guests to bring their sunglasses or flip flops? Flip flops and sunglasses can add a bit of fun to your invitations. It lets your guests know that this is going to be a fun occasion. You can also just go for a big beach area of sand and ocean. It's all good. Will there be seashells by the sea shore? 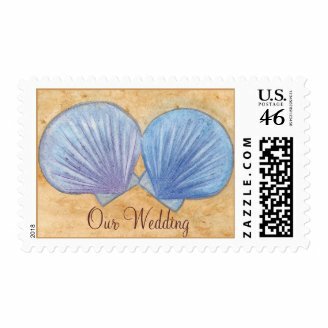 If you know that there are seashells where your wedding will be, or nearby, this is a fun way to let your guests know. Some of your guests are probably collectors of shells, and will appreciate the little hint. Do you hear the sound of the ocean? Will the waves be lapping against a ship? If your wedding includes a cruise, you can show your guests an image of the big blue ocean. The words, I do, are written on the seashell pictured below. Did you find a favorite design? Congratulations! That's one more thing done for your special day. type in your desired keywords along the word stamps in the search box at the top of the product page. There will be lots more to choose from. Remember to bring some extra sunblock; your guests will appreciate the thought. May your wedding be beach perfect. Your comments and questions are welcome. Thank you janices7, and thanks for the tip too. 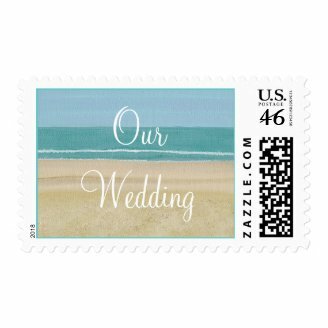 Cute stamps - they'd be great for a beach-inspired bridal shower too! Weddings are special. You can select from Unique Wedding Invitations that can reflect your personalities. These can also be customized online.